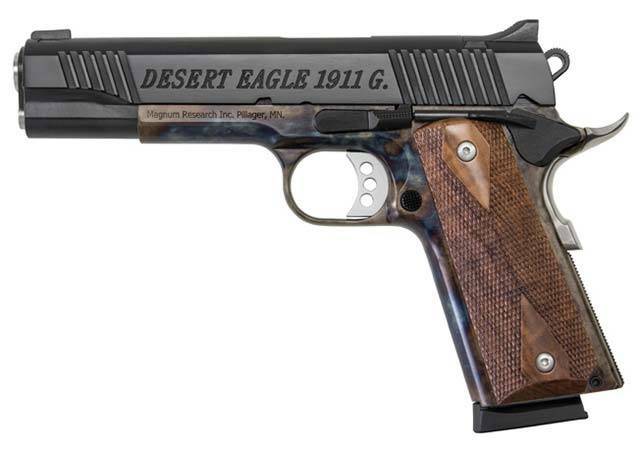 Magnum Research announced the introduction of four Desert Eagle 1911 guns to be sold exclusively through the outdoor retailer Cabela’s. The first two guns use cast carbon steel frames with a gray Cerakote finish. The matte black slides are machined from solid billets of steel. A 5″ barrel “G” model and a 4.33″ barreled “C” model will be available. MSRP for either pistol is $948. The second two guns, one a “G” and the other a “C”, have a case-hardened carbon steel frame. MSRP on these pistols will be $1,120. POMONA, NY – USA based, Magnum Research, Inc. (MRI) has once again partnered with Cabela’s to offer four exclusive new designs for the Desert Eagle 1911G and Desert Eagle 1911C. The first two models are the .45 ACP “G” and “C” pistols, model number DE1911GSBCAB and DE1911CSBCAB. The frame on both is precision cast, machined from high-quality carbon steel, and the slide is machined from solid billets of steel and then finished in a matte black. The exclusivity of this model is the commanding gray frame which has been treated with a high temperature ceramic Cerakote™ coating and is accented with attractive black appointments. MSRP on either model is $948.